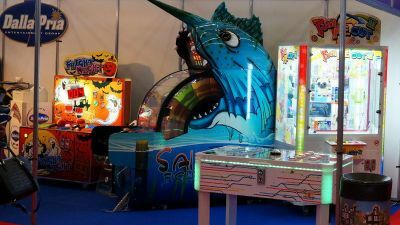 Thank you for visiting EAS 2014 Expo (Euro Attractions Show) in Amsterdam, where you could find and test our amusement machines at Della Pria – Highlight of the Games booth (no. 7222). EAS is Europe’s only trade show exclusively dedicated to the European leisure and attractions market. EAS has more than 8,500 buyers from all sections of the industry, theme parks, amusement parks, family entertainment centres, bowling alleys, waterparks, carnivals, attractions, zoos, museums, aquariums and much more. These buyers come from more than 100 different countries, giving exhibitors greater buyer exposure. Thank you for playing Catch The Light game at EAS 2014 at Amsterdam RAI Exhibition and Convention Centre!